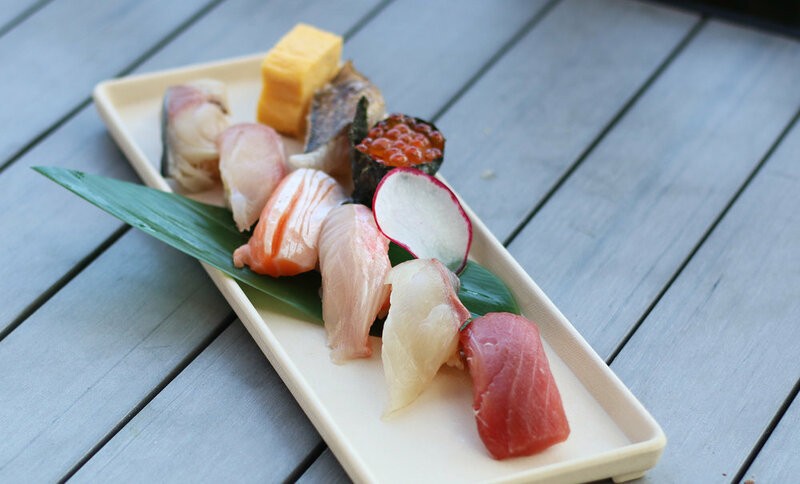 Other than its close proximity to the ocean, there aren't many reasons why El Segundo would be THE neighborhood that Angelenos associate with great sushi. Which is probably why it's such a coup to have the sister restaurant of one of West LA's great sushi spots, Hamasaku, who late last year opened Umi by Hamasaku at the chic new development, "The Point." Though the original location focuses on sashimi and omakase, this bigger, beautiful, and more modern space focuses on seafood izakaya in addition to sushi. From partners Jesse Duron, chef Yoya Takahashi and owner Michael Ovitz, the restaurant is currently open for lunch and dinner, additionally offering seasonal shared plates and, of course, omakase. We popped by for an early lunch and got to sample a bit of everything. 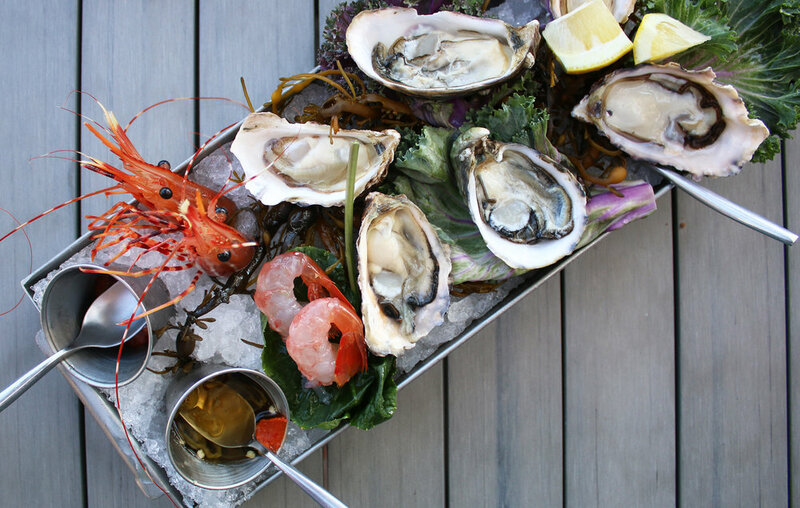 We started out with a refreshing selection of oysters, which were all crisp and yet meaty. All of the accoutrements were nice and bright, and provided a fun way to start the meal. One of our first dishes was the "Potato Salad"-- and though I honestly struggled to decipher exactly what this dish was, it turned out to be one of my favorites. Creamy potatoes form a base, and are topped with smoked salmon, truffle blue cheese cream sauce (!! ), and an egg yolk. We were advised to use the gem lettuce like a taco shell, piling the rest of the ingredients into it. It was such an interesting yet satisfying combination: a mishmash of breakfast, lunch, deli food, and Japanese flavors. The truffle and blue cheese added even more depth to this flavor combination, and I really loved the creaminess of the potatoes with the runny egg yolk and crisp gem lettuce. Next up was the Toro Tartare, a surprisingly light presentation of a fatty fish that was enhanced with crisp, sweet apple, a runny quail egg, and an umami rich sauce. A nice little bite to share! Being the basic Angeleno that I am, I ordered the Spicy Tuna and Crispy Rice, and was surprised to find a deconstructed version of the classic. 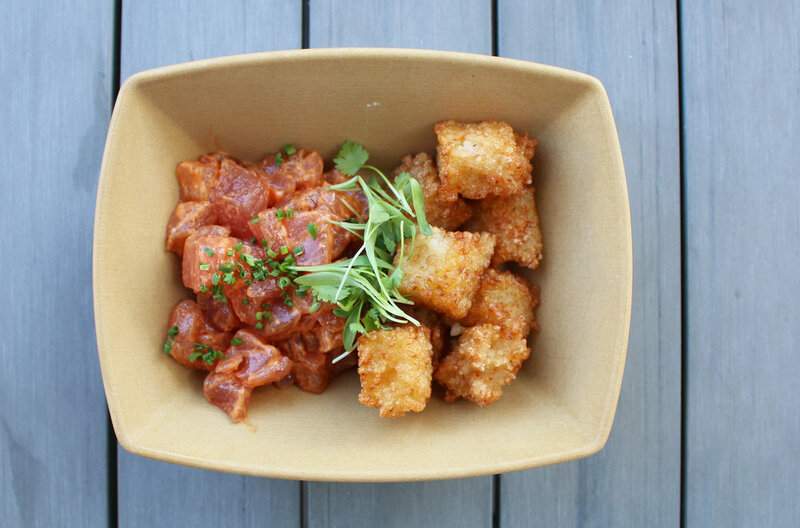 The dish was presented as two separate entities (instead of the typical spicy tuna piled on top of crispy rice: a classic Hawaiian poke accompanied by crispy rice tater tots. Separately, they were both tasty, and when eaten together, really fun and delicious. Another highlight of the meal was the nigiri selection, which gave us a range of fish to sample, all clearly fresh and living up the quality that Hamasaku is known for. Definitely one of the most surprising dishes was the Oyster Dynamite, which seemed like it consisted of an Oyster Chowder topped with a Pot Pie crust. The flavors were definitely bold and interesting, and that crust was fluffy and delicious. But this dish is definitely for major seafood enthusiasts and may not be a favorite of everyone. After all the raw fish, we were definitely (pleasantly) surprised to be presented with a bowl of ramen. The noodles were soft and a bit thick, topped with a few select ingredients that kept it simple but really tasty. Perfect for a nice cold day. Overall, our meat at Umi was great, showcasing the quality and craftsmanship of Hamasaku. It was easy to see that Chef Yoya Takahashi has taken a lot of risks here, presenting izakaya dishes that may be out of the average LA sushi lover's comfort zone (like the Oyster Dynamite). 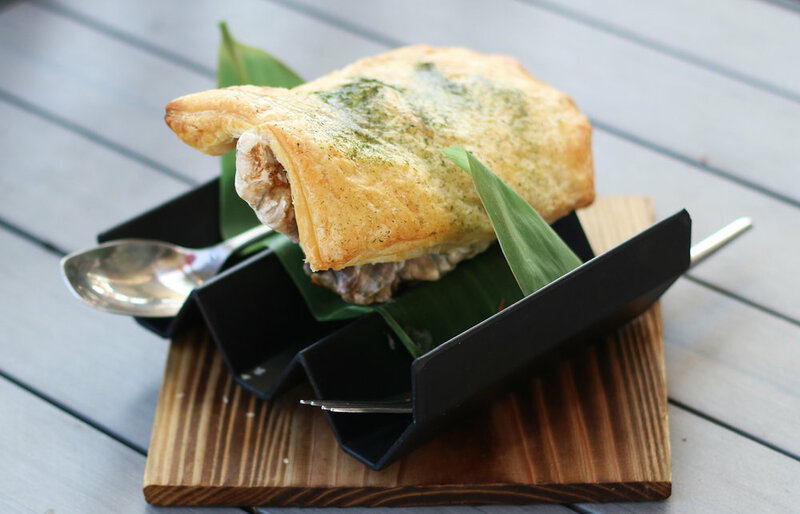 Sometimes encountering The New can be uncomfortable or confusing, but Umi has presented their fresh take on sushi and izakaya in ways that are fun and approachable, mixing in familiar ingredients and preparations. I'm definitely hoping to come back soon and try even more (there was so much I wanted to but simply didn't have room for! ), sampling both some more classics (I'm looking at you, Miso Black Cod), and the more adventurous offerings (oh hey, Jidori Dashi Omelette! ).